Many, many years ago nearly all the forests in the area around Mountain Crossings (and all over in these mountains for that matter) were clear cut for their timber as industrial logging swept the south. Poor farmers sold off thousands of acres of forest land to northern timber industries for very low prices. 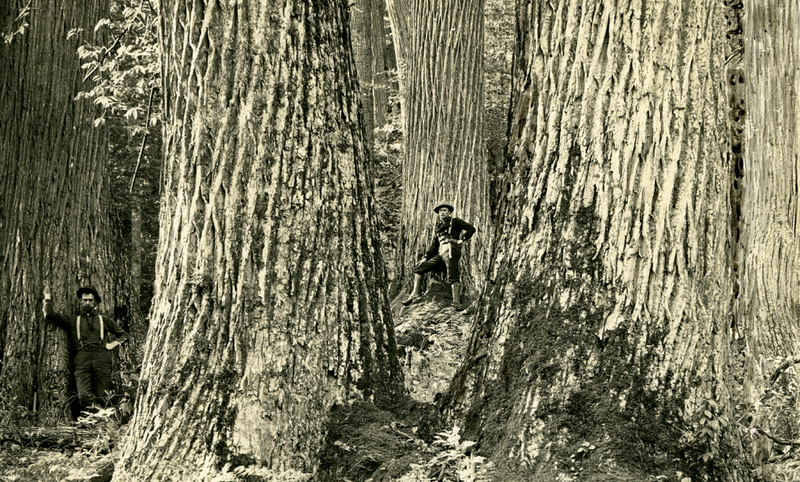 In 1911, the Weeks Act brought about the creation of the U.S. Forest Service, which was intended to collect up large plots of lands for sustainable timbering. Between 1933 and 1942, the Civilian Conservation Corps planted an estimated three billion trees throughout the country. Thus the nickname, Roosevelt’s Tree Army! This is largely the canopy you see today in the woods of North Georgia, though in the 1950’s the U.S. Forest Service began to clear cut many, many acres of their so called preservation land, taking down nearly all the remaining old growth forests. Things have since changes and thankfully, there are a few pockets in the mountains around us that still house a few old growth trees of incredible size. In the 1800’s a nursery owner imported some Japanese Chestnuts that had a fungus that the native American Chestnuts were unable to build a resistance to. Cooper Creek Wildlife Management Area is one such area that holds a grove of these massive trees. The WMA covers 30,000 acres of land in Fannin and Union Counties. There is a hike in particular that leads down to the “Valley of the Giants”. These trees are not as massive as the Redwoods of Northern California or as large as the American Chestnuts that were wiped out in the 1800’s, but they are way bigger than anything we are used to seeing! 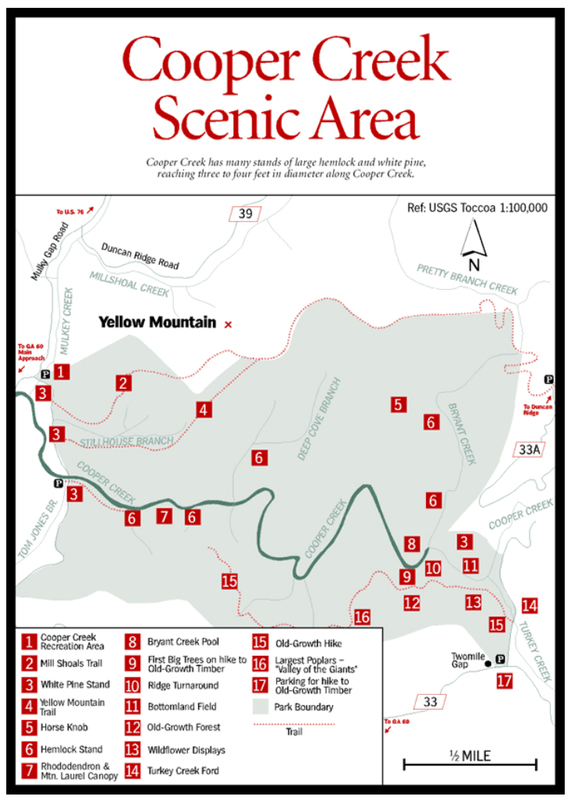 The Old Growth Forest hike in Cooper Creek WMA takes you along side creeks, down old road beds, through coves and over ridges. It is a very easy hike with only moderate elevation changes. Because of the remoteness of this hike, maintenance is rare and the hardest part is maneuvering around, over or under blow downs. From Rte 60, turn onto Cavender Gap Road. Follow the road until the pavement ends and the gravel road begins. The first gated road on the left has a small pull off, this is the beginning of the trail to the “Valley of the Giants”. 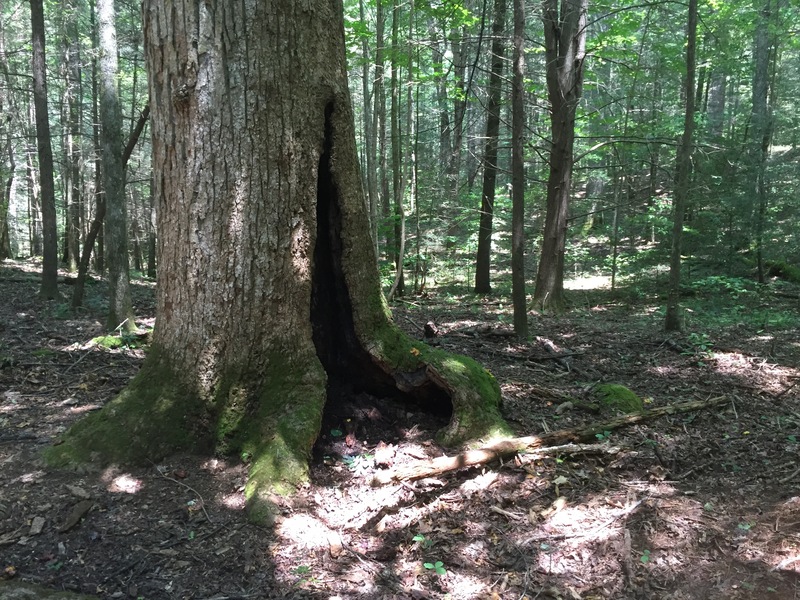 Sherpa Guides has an excellent excerpt detailing the trail as it leads to the old growth trees. “OLD GROWTH FOREST HIKE. [Fig. 22(11)] About 1 mile. Park at a low gap [Fig. 23(17)] about .4 mile from the end of the pavement going east on FS 33. There will be an old road pitching steeply north, the first road to the left after leaving the pavement. Walk down this road and take the first left-hand log road [Fig. 23(13)] just before the Turkey Creek ford. This nearly level log road passes through several moist coves with wildflower displays. Across Cooper Creek is a 6-acre bottomland that has been continuously in cultivation since the time of white settlers and probably since Indian days. Here is the map that Sherpa Guides provides. Park at #17, follow the gated road to #15 and that trail will lead you to some excellent trees! This entry was tagged Cooper Creek WMA, Day Hike, hiking, mountain crossings, Old Growth Trees, Tulip Poplar Trees, US Forest Service, Wildlife Management Area. Bookmark the permalink. Thanks for the information when is your next hike there o cooper creek I wood like to join.